Who doesn't love a getaway?! It's been a zany month relocating to the upper east side, getting settled in and then of course picking up an end of winter cold (thanks Universe!). Thankfully, the last of my cough left right as Ben and I jet setted down to Miami to celebrate our three year anniversary. It was the first vacation we've taken since we switched to eating vegan last summer. We thought it would be tricky but Miami ended up being a great destination for vegan eats. Our landing was ROUGH - the pilot for whatever reason performed what I later learned to be a "go- around" which is when the pilot, for a myriad of reasons, chooses to land and then TAKE OFF AGAIN IMMEDIATELY. I'd never gone through this, and my worry scale reliably shoots from 0-100 in these situations so my nerves were totally shot when we finally made it to the hotel. Thankfully, The Washington Park Hotel greeted us with a complimentary cocktail and everything was on the upswing from there. Weary from travel, we managed to drag ourselves down to Plant Theory and recharge with yummy eats. Recharge enough to um, go lay down by the pool. After some tedious and demanding laying down by the pool and then napping we made our way to gourmet vegan restaurant Full Bloom. Located on street level of a hotel, we sat outside in the prefect weather and shared a couple tasty items off the menu. I like trouncing around Miami during the offbeat times i.e. the early morning. Party goers are still sleeping in from the night before and it feels like you have the whole city to yourself. We trotted down to Dirt and discovered the wonders of Matcha Pancakes! A little trip to Panther Coffee was a nice pick me up before heading to Wynwood. Nothing like nitro cold brew to do the trick. What's fun about Wynwood is that the walls are always evolving. What I saw a year ago in Miami is gone and replaced with an abundance of new murals and art. Happy to see my favorite mural featuring two spacey farm folk is still up! 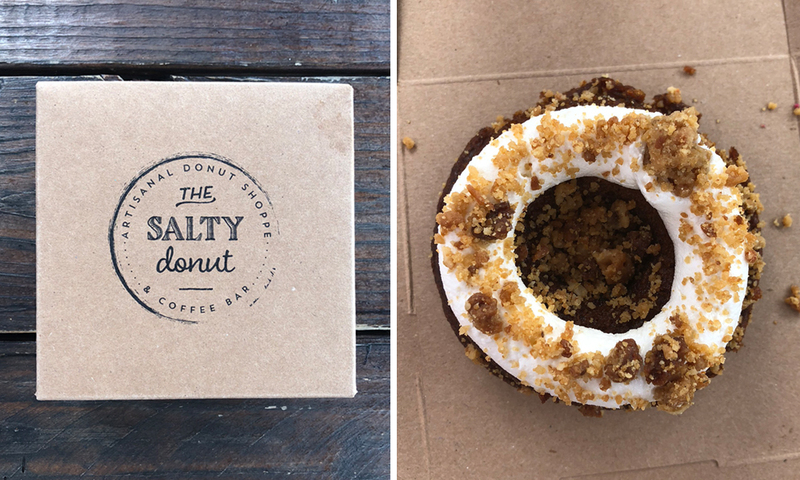 Salty Donut took care of it's vegan patrons for sure - this pineapple centric donut definitely delivered. Almost a little too far to walk in the Miami sun, we managed to make our way to St. Roch's Market in the design district. Initially enticed to this area by Chef Chloe's new cafe, we stumbled upon another restaurant, Yuzu, featuring a ramen bowl we couldn't pass up. Bao buns to start and then wrapped it up with a ramen slurp fest. This was a big draw of the trip. And guess who was at the counter – CHEF CHLOE HERSELF. Turns out we picked the day of her book signing to visit and it was a delight to meet her in person. Speaking of delight, her chocolate chip cookie was outstanding and the matcha soft serve was unique not only in flavor but also presentation. I was so tuckered out at this point it was time for a recharge at the hotel. Once we felt rested we rendezvoused two blocks to south beach! Happy to have at least seen it, snacking got the better of us and we dived into an acai bowl from around the way. Refreshing! My vacation appetite was upon me thus beginning the quest for the only meal that would do, BURGER and FRIES. I recalled a Burger FI was close by and we had merely recently discovered back in New York that they carried Beyond Burger. Two burgers, onion rings and french fries later it was time for a slumber party candy binge fest back at the hotel. This was the best way to end cap an exhausting but priceless day. We were feeling burgers and Burger Fi was right down the street. They only use peanut oil so we snagged fries and onion rings along with our Beyond Burgers. The hotel breakfast was not too vegan friendly but I discovered Pura Vida the night before and it sounded like it would be a good breakfast option. It was! They featured a whole vegan menu which we proceeded to order from, vigorously. Yum.